01. Principles of a Healthy Diet: How do We Know What to Eat? Dr. Robert Baron explains that your actual risk of disease results from the interplay between the genes you inherit and the diet and lifestyle choices you make. Dr. Robert Baron discusses the rise in obesity rates and associated detrimental health effects. Dr. Robert Lustig argues that sugar and processed foods are driving the obesity epidemic, which in turn affects our endocrine system. 04. Dietary Fiber: The Most Important Nutrient? Katie Ferraro, Family Health Care Nursing at UCSF School of Nursing, explores the types of fibers and their health benefits. Some fats are better for your health than others. Katie Ferraro, registered dietitian at the UCSF School of Nursing, explores the different fats, and which you should try and avoid. Dr. Jeffrey Tice, UCSF Department of Medicine, looks at vitamin use and the benefits and harms from these dietary supplements. Katie Ferraro takes us through the history of the food pyramid and how to judge what to put on your plate to maintain healthy weight. Katie Ferraro explains a healthy person on 2,000 calorie diet per day should strive for 65 grams total fat, less than 20 grams saturated fat, zero grams trans fat and under 200 milligrams of dietary cholesterol. 09. How do We Know What to Eat, Drink (and Take)? 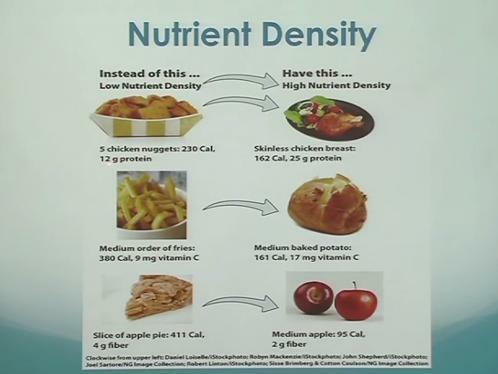 Dr. Robert Baron, UCSF Professor of Medicine, explains the costs of poor nutrition and what you can do to improve your diet. Dr. Robert Baron, Professor of Medicine at UCSF, explains the prevalence of obesity and the trends in the rates of obesity then looks at what to do. This is a six-part documentary series that looks at the real science behind the food we eat and reveals the truth about the effects of food on our bodies. This course provides an overview of digestion and metabolism of nutrients. Foods are discussed as a source of nutrients, and the evidence is reviewed as to the effects of nutrition on health. Tracing the evolution of the human diet from our earliest ancestors can lead to a better understanding of human adaptation in the past. It may also offer clues to the origin of many health problems that we currently face, such as obesity and chronic disease. Learn the right balance of foods to maximize your health and energy level through an anti-inflammatory eating plan. This series explores the concept of healthy eating and explains the molecular and hormonal basis of energy balance and appetite control. Diet and Obesity: Manna from Gods or the Food of Destruction? Obesity has shifted from being a rare symbol of decadence and riches to a widespread problem of ignorance, poverty and economic exploitation. Learn the latest practical dietary suggestions to reduce risk and progression of heart disease, including strategies for reducing inflammation and lowering LDL cholesterol. This is a three-part documentary series hosted by Cherry Healey, investigating the alarming rise in numbers of young people suffering from illnesses associated with older people due to alcohol, drugs and obesity. Tracing the food system through the rise of industrial agriculture at home and abroad, the twelve week course will introduce students to some current and controversial ideas about the future of food, through conversations with some of the leaders of the food movement. Telling stories about where food comes from, how it is produced - and how it might be produced differently - plays a critical role in bringing attention to the issue and shifting politics. This course aims to familiarize the student with relationships among the physical, social and psychological aspects of health, which include: self-care, prevention and analysis of personal health problems through participation in self-assessment techniques.